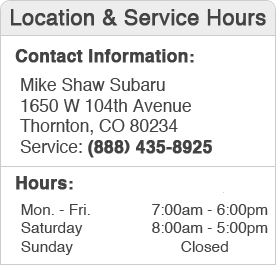 Mike Shaw Subaru is proud to be the Subaru dealership that offers car repair & maintenance options for all Subaru owners in the Thornton and Denver, Colorado area. Our Subaru Certified Trained Technicians and knowledgeable staff will help you by offering the best service possible at low prices. We provide more than just Oil Changes for your Subaru we provide other common repairs and services such as Brake Inspections, Tire Repair, All Wheel Alignments, Battery Replacement, Transmission Maintenance, and many other Subaru Services. Please take a look at our Subaru Recommended Service Schedules for a full listing of common maintenance options based on the mileage of your Subaru. We also offer monthly Service Specials to help you save as much money as possible when having car repair & service performed on your Subaru Vehicle. Our services are competitively priced and we promise to give you our best service possible.